Step 1: Image Placement - The EBI print head generates controlled patterns of electronic charges on a rugged, anodized aluminum transfer drum as the result of the principle of corona discharge. The corona discharge process is exceptionally fast and reliable and similar in some ways to generation of electrons by the sun in our solar system. There is one electron beam dedicated to each dot produced on the image, allowing the engine to operate at very high speeds. EBI printing is an efficient "write black" process where the patterns of charges are applied directly to the transfer drum. By comparison, electrophotographic printers first charge the entire drum surface, and in a second step, remove the charge. This "write white" process requires sophisticated moving optics that need frequent maintenance and service when operated at very high speeds. EBI print engines are in production and operating daily at speeds in excess of 450 feet per minute without the complex support requirements necessary for other digital print engines. Step 2: Toner Application - The charged surface of the transfer drum that forms the latent image attracts toner particles. EBI toner contains a controlled percentage of magnetite the ingredient use in toner for Magnetic Ink Character Recognition (MICR) printing applications. Inherent in the EBI printer engine design is the capability to produce MICR output without complex toner reformulation. A range of EBI toners are available with different characteristics to satisfy a variety of applications. Step 3A: Pressure Fusing - To fuse the toner into the paper, a simple roller applies cold pressure to transfer the toner to the paper. EBI print engines normally achieve greater than 98% toner transfer efficiency and do not require heated fusing rollers or consume silicon oil. Cold pressure fusing completely eliminates the nead for a "developer station" in the print engine. There is no down-time required to change the developer that is frequently a maintenance issue with electrophotographic printer engines. Step 3B: Radiant Heat or Flash Fusing - Pressure-fused EBI images are durable with high permanence. To help sustain image integrity after rigorous handling in post processing and mailing applications, a secondary fusing process is completed before the paper exits the printing system. A "flash" fusing station is incorporated in RS Series printers while continuous "radiant heat" fusion is applied in the ultra high-speed CR Series. Step 4: Toner & Charge Removal - To prepare the transfer drum for the next print image, any residual charge is removed by the "erase rod". This neutralizes the surface of the transfer drum in preparation for re- exposure to the print head. 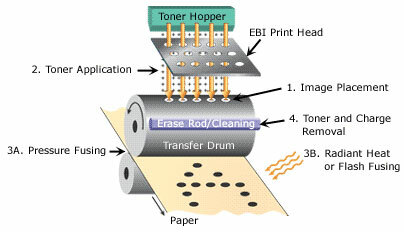 Any remaining toner particles are removed from the drum by a simple cleaning roller.